We left Florida Monday morning and ventured up I-95 to Charleston, SC. Our trip was uneventful, other than seeing three different men peeing on the side of the road while going through Georgia. Perhaps the state should put up a rest area on that short 105 mile stretch through that state!! And if you have a four-door vehicle, open both doors and stand in the middle….just a thought! After getting set up in our campground, we were excited to visit historic downtown Charleston. Unfortunately, we arrived the day after Easter, when many families were on Spring Break. It was a traffic nightmare! After driving around for over an hour, finding parking lot after parking lot, full, we just gave up. And then spent another hour in bumper to bumper traffic to go 15 miles to back to our campground. We were both very frazzled and disappointed! After taking the dog for a long walk to calm our nerves, we turned on the news, and the lead story was coverage of a meeting going on in Charleston to try to improve visitors experiences to the city! We both laughed at the irony. They are trying to figure out what to do about the traffic jams and the lack of parking. Hopefully they will come up with a solution. 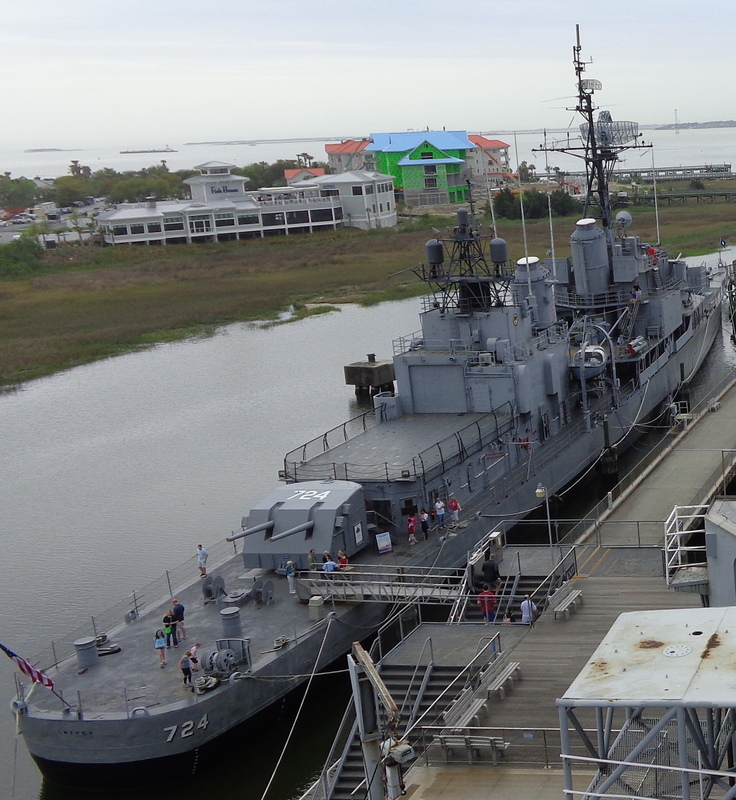 Today we got up early to beat the traffic and head over to Mount Pleasant, SC to see Patriots Point Naval and Maritime Museum. Unlike yesterday, today we had an awesome experience! If you are in the area, we would strongly recommend spending time visiting this place. Patriots Point is home of the aircraft carrier USS Yorktown (CV-10), Destroyer Laffey (DD-724), Submarine Clamagore (SS-343), Medal of Honor Museum and The Vietnam Experience Exhibit. 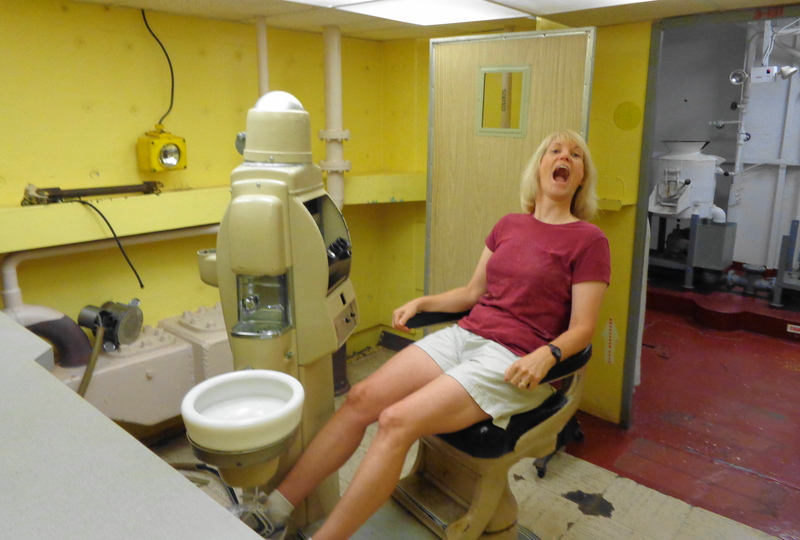 Admission is $20, and you can easily spend all day touring everything. We spent about 5 hours, and could easily have taken more time to read all the exhibit signs. 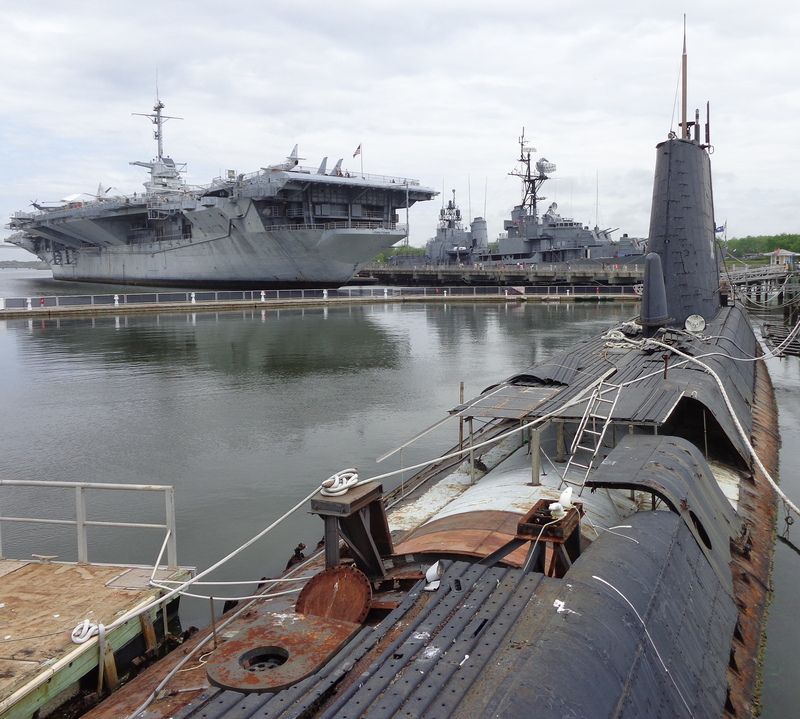 Here is a view of all three in the water. The USS Yorktown Aircraft Carrier was commissioned on April 15, 1943 and fought in many historic battles in World War II. 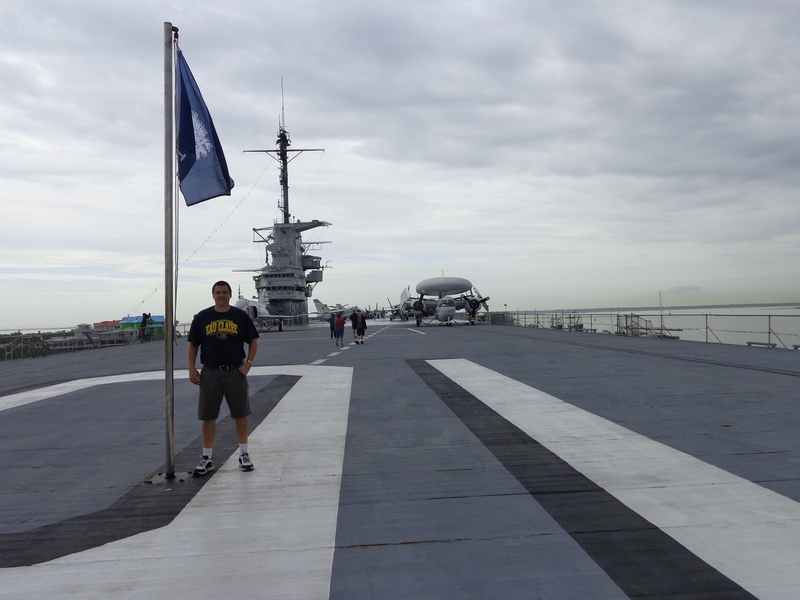 She was converted to an antisubmarine carrier in the 1950’s and served in that capacity in the Vietnam War. 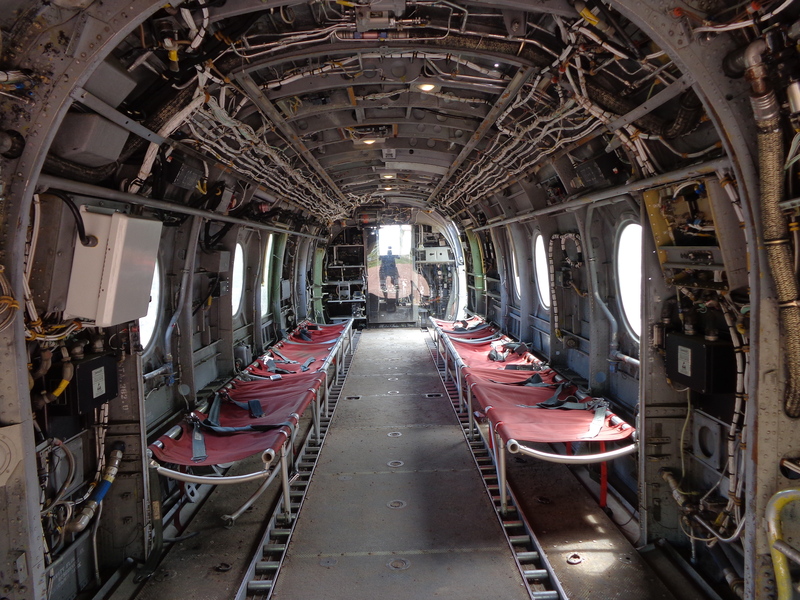 In addition, the carrier recovered the Apollo 8 astronauts and their capsule after they returned to Earth. 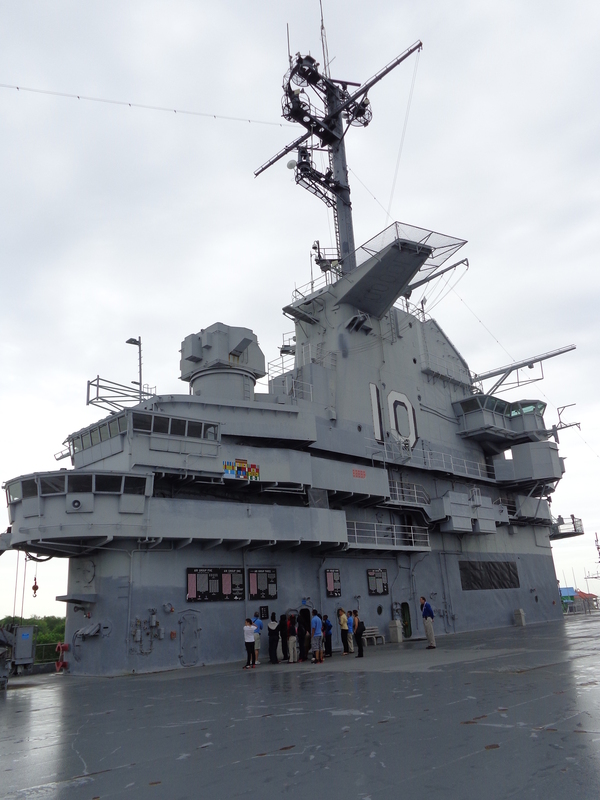 The carrier is very impressive in size at 888 feet in length. 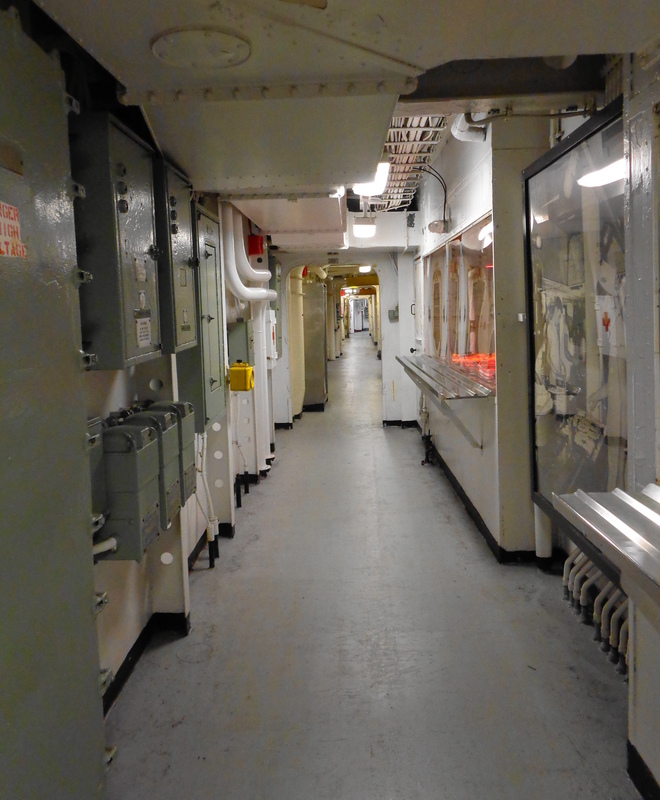 The self-guided tour allows access to many areas of the carrier, giving you a good idea of what life was like on board. During WWII, 3,088 enlisted men along with 380 officers served on duty. 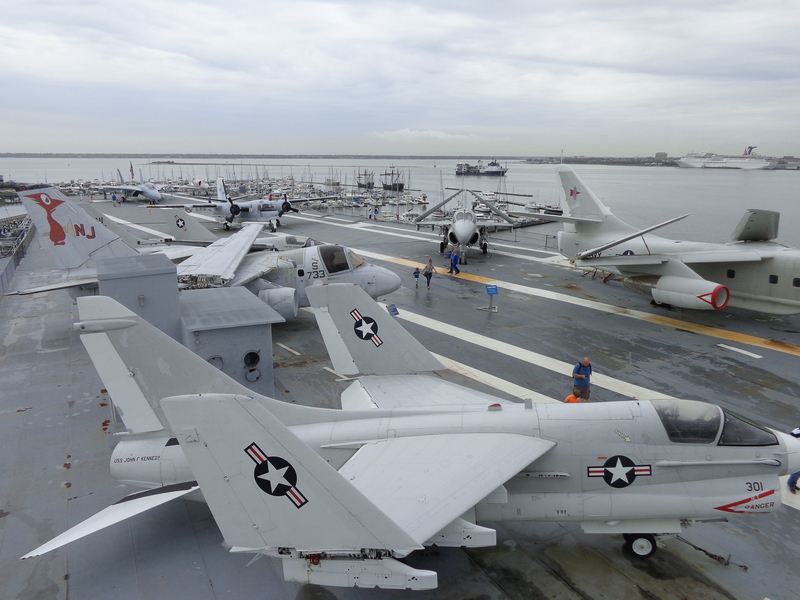 They had 90 planes on board between the flight deck and the hangar, which is just below the deck. 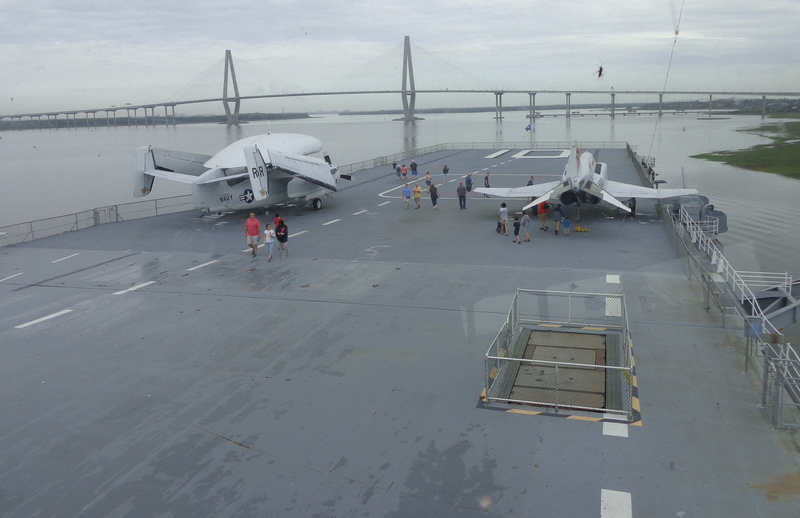 The tour provided access to all levels on the carrier. 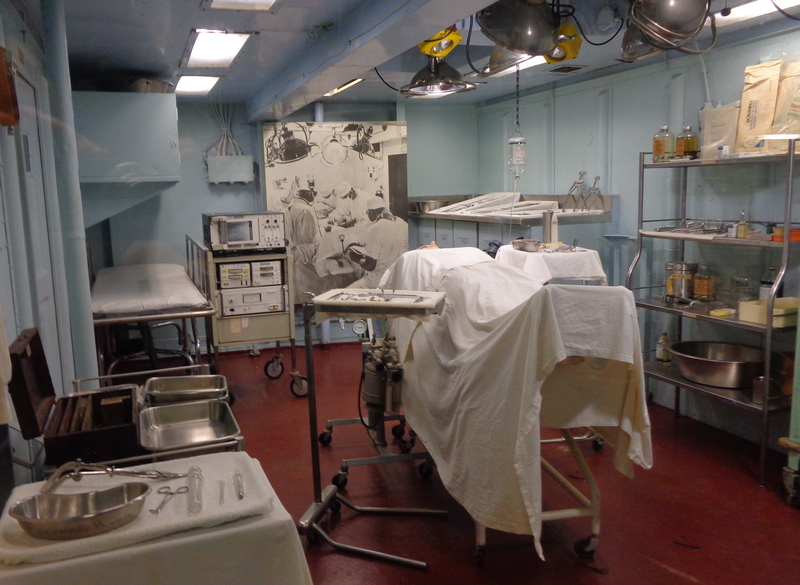 There is an extensive medical and dental area. 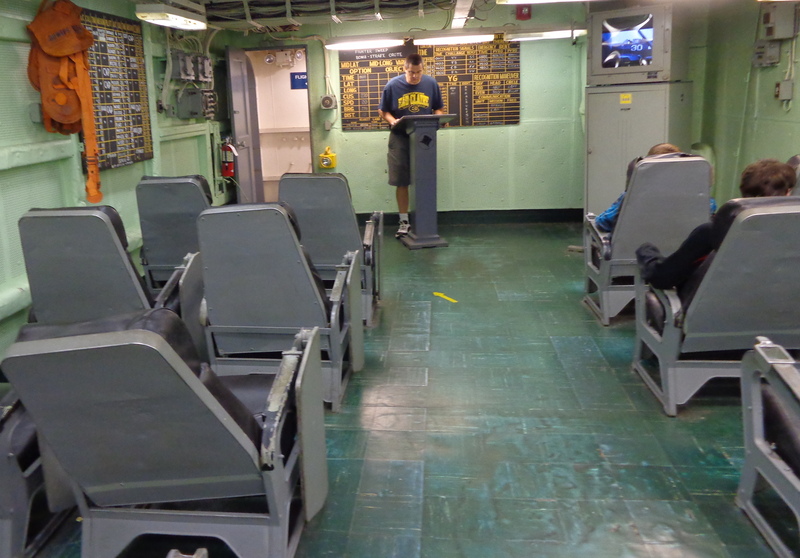 The enlisted crew did not have much privacy, as they had a bunk and a small locker. 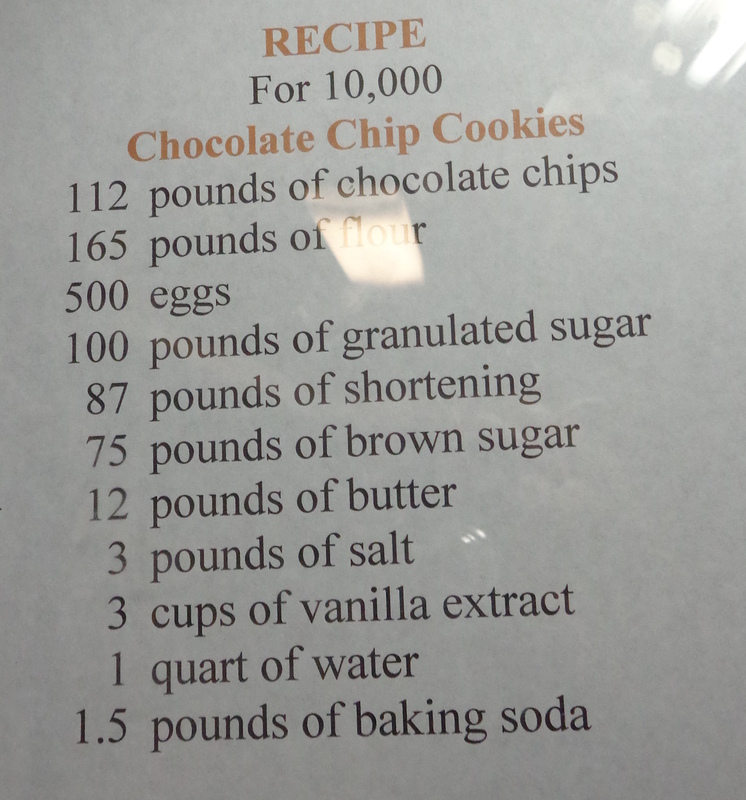 The carrier had their own bakery, and they had several recipes on display, including this one to make 10,000 chocolate chip cookies! 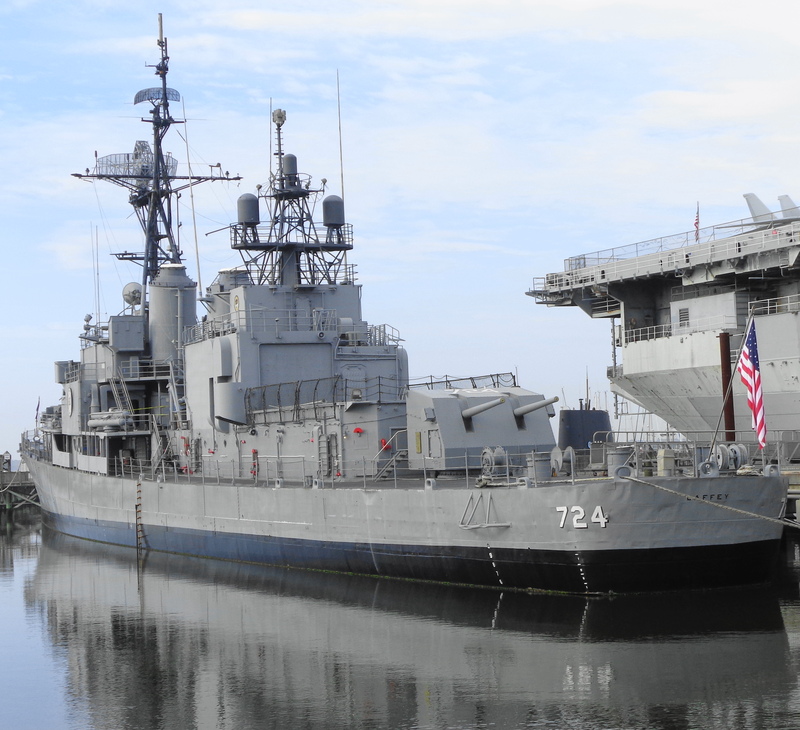 The Destroyer Laffey seemed rather tiny next to the Yorktown Carrier, although it is still 376 feet long. 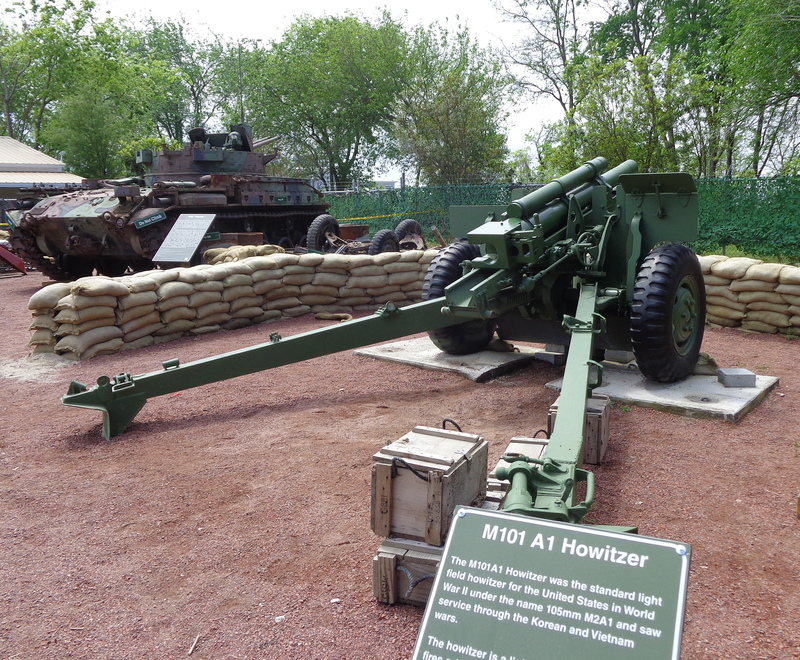 The Laffey was involved in the D-Day landing of Allied troops in Normandy. Just four months later it was out fighting in the Pacific. On April 16, 1945, the Laffey was bombed by the Japanese and several kamikaze planes. 32 men were killed and the ship sustained heavy damage. Yet the crew of 336 continued fighting and shot down their attackers. The destroyer earned the nickname “The Ship that Would Not Die.” This is a view of the Laffey from the deck of the carrier. The front gun mount on the Laffey was the area struck by the bombs. It was rebuilt and now they show a short, but sobering film about the attack and the men who were working inside the mount. 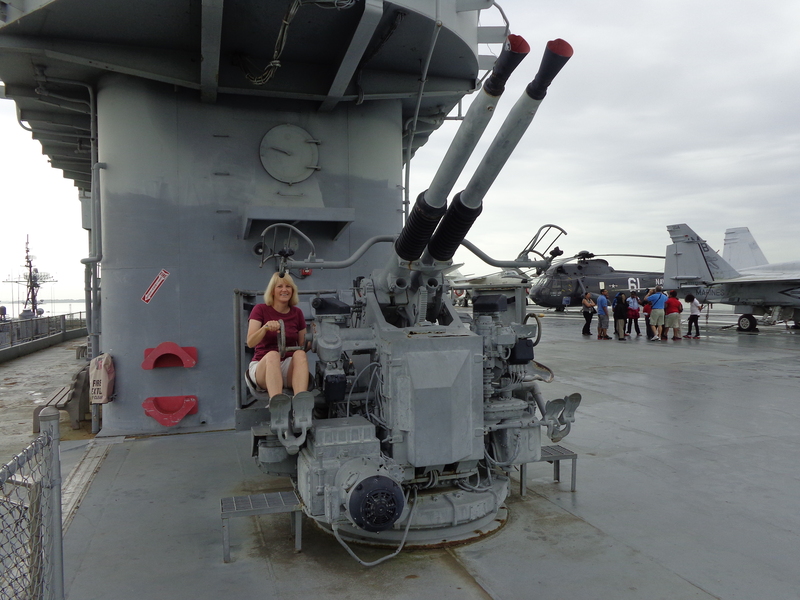 As with the Yorktown, you can view many levels and rooms. 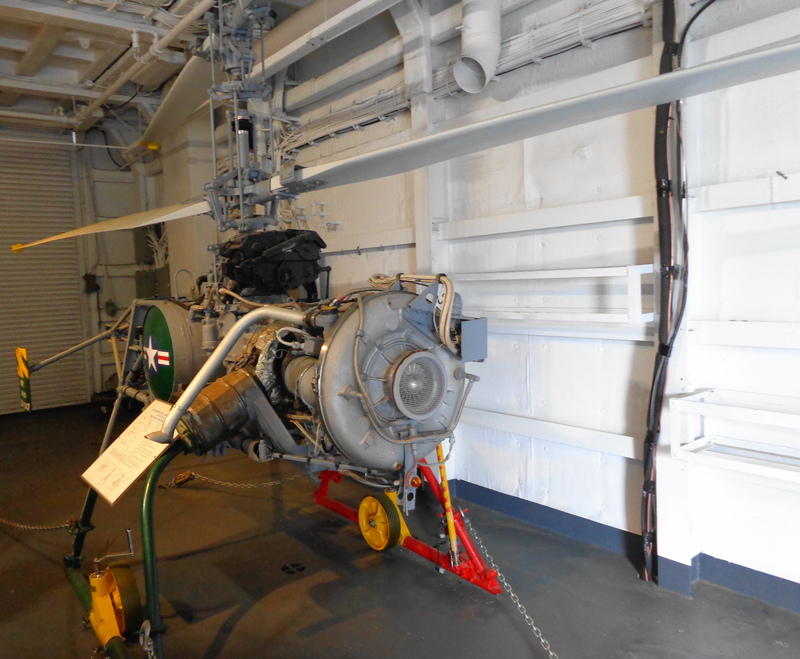 The Laffey contained this very interesting US Navy QH-50D Drone Anti-Submarine Helicopter (DASH) from 1966. Many people commented on this “old school” style drone. Drones have certainly come a long way in design and technology! The submarine Clamagore was commissioned in 1945, near the end of WWII. 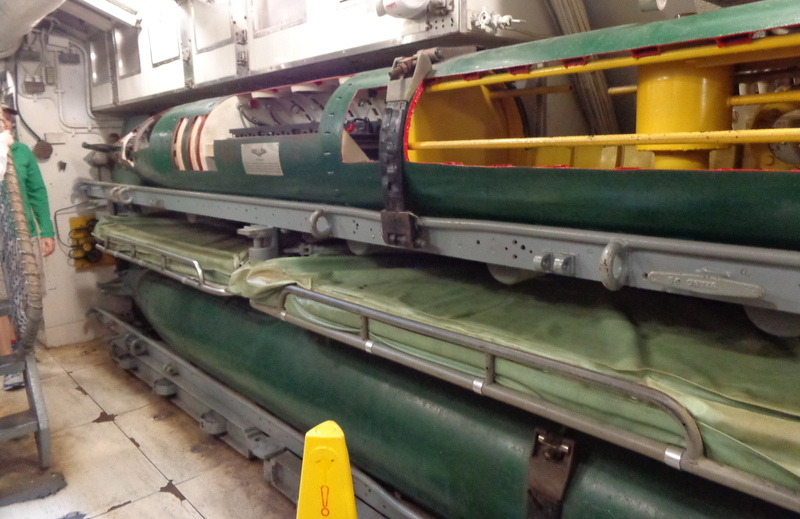 This diesel-powered sub remained in service until 1975. 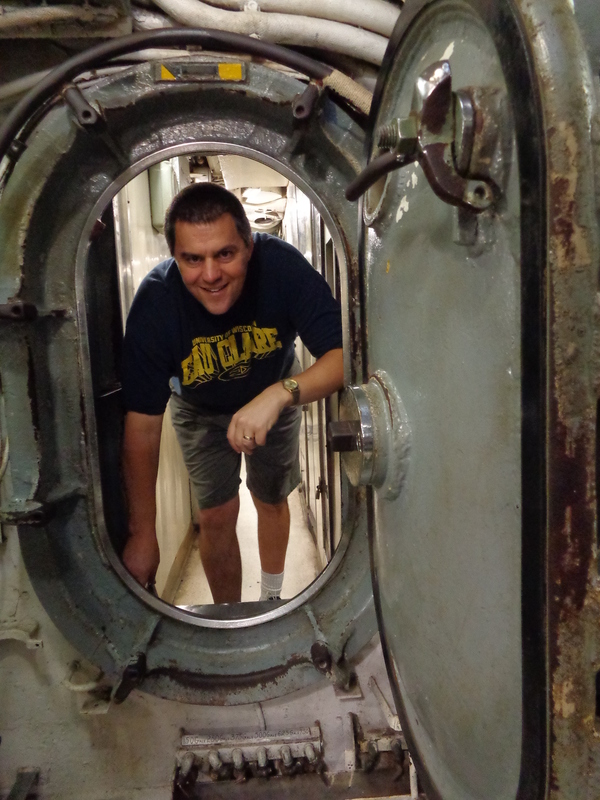 The sub in not for someone afraid of confined spaces! There are a lot of small spaces to navigate through. 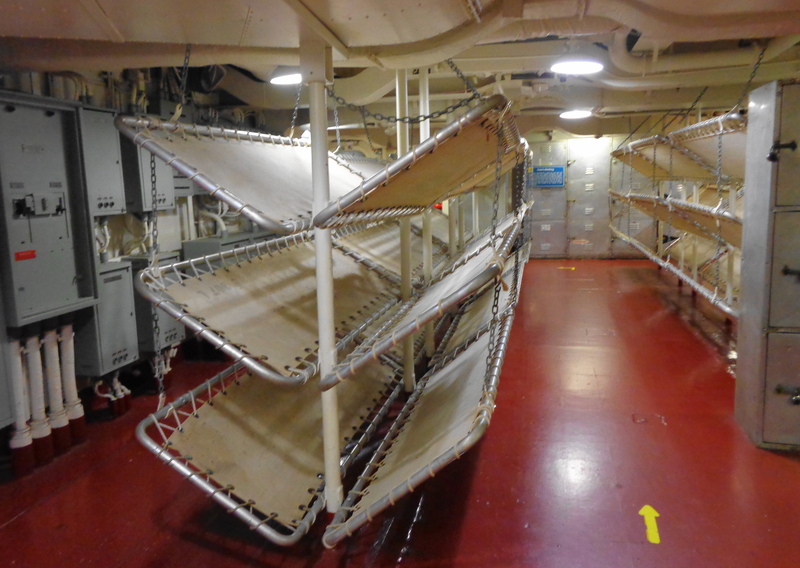 Torpedo room and bunks for the men assigned to this detail. 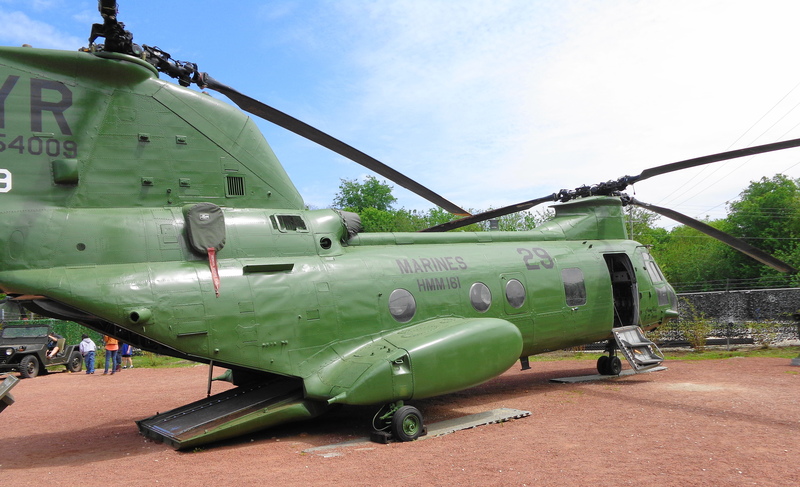 Patriots Point also has an area on land entitled The Vietnam Experience, to show what life was like during the Tet Offensive on a US Navy Advanced Tactical Support Base and a US Marine Corps Artillery Firebase. It was a very moving exhibit. This was truly a wonderful display of military history. We want to thank everyone who has served our country in the military including some of our family and friends. In 2014, we were legal residents of two states, and worked in three states. This may sound like a potential nightmare for filing taxes, but in reality it was not too difficult this year. And, we opted to try out H & R Block’s software, given all the issues with Turbo Tax this year, having stripped out some of their forms from the Deluxe version. We found Block’s software to be just as user friendly as Turbo Tax, and it was substantially cheaper (we found ours at Target, on sale for $34.99, verse Turbo Tax Premier which was $79.99). We “resided” in South Dakota and Florida last year, both states that have no income tax, or tax on investments. So we did not have any forms to complete for these states. We received W-2’s for our work in South Dakota at Crazy Horse, and multiple W-2’s from Amazon for working in Kentucky and Indiana. We needed to file Federal and non-resident state forms in Indiana and Kentucky. We decided to use our “free” state download form on Indiana, since Kentucky’s non-resident tax form is very easy to complete by hand. We made a wise choice, as we found Indiana’s form a bit confusing, so we were glad to have the software assist us. While everyone’s tax situation is different, we always declare “0” dependents on the Federal W-4 withholding tax forms, and “2” dependents for the state tax forms. By declaring “2” dependents, we have the least amount of money withheld for state taxes, and that works out well for us. We do not want to receive a large refund from the states. That is just our preference. This year worked out pretty well, as we will be getting less than $250 combined back from both KY and IN. We may have to rethink our deductions for the Federal form though, as we ended up with a pretty large refund. Last year we funded, for the first time, a Health Savings Account. We were not sure how that would impact our taxes, and discovered the HSA saved us money as it is a credit right off the top of your income. And the HSA is available for anyone who has a high deductible health plan. We are not experts at taxes, so please don’t rely on us for advice! I’m just trying to give you an overview on our taxes with work camping in several different states. We will be leaving warm and sunny (and humid) Florida next Monday, April 6th. Originally we wanted to stay one more week, and head back over to the Gulf side of Florida. But our neighbor here at the campground noticed that one of our hydraulic leveling jacks was leaking fluid on the very hot and humid days. Since our 5th wheel is still under warranty, we contacted Heatland and they recommended a place in Elkhart, Indiana for warranty work. (we had told them we would be coming up that way). So we will be leaving a week earlier. After looking at Google Maps and discussing various routes with our neighbors, we decided to take a new route and go through South Carolina and North Carolina on our way home. We have not yet decided if we will continue up I-77 through Virginia and Ohio, or cross over I-40 into Kentucky. We have heard both positive and negative things about both routes. We need to be in Indiana for our appointment on 4/13, and then back to WI for doctors appointments on the 20th. Then it will be back to work!! In May, we will be heading West, to work at the Homeroom @ Madison Crossing located in West Yellowstone, Montana. This gift shop specializes in cabin décor and is located just three blocks from the entrance of Yellowstone National Park. We will be working with our friends Tom and Ellen (from Amazon), that recommended the job to us. 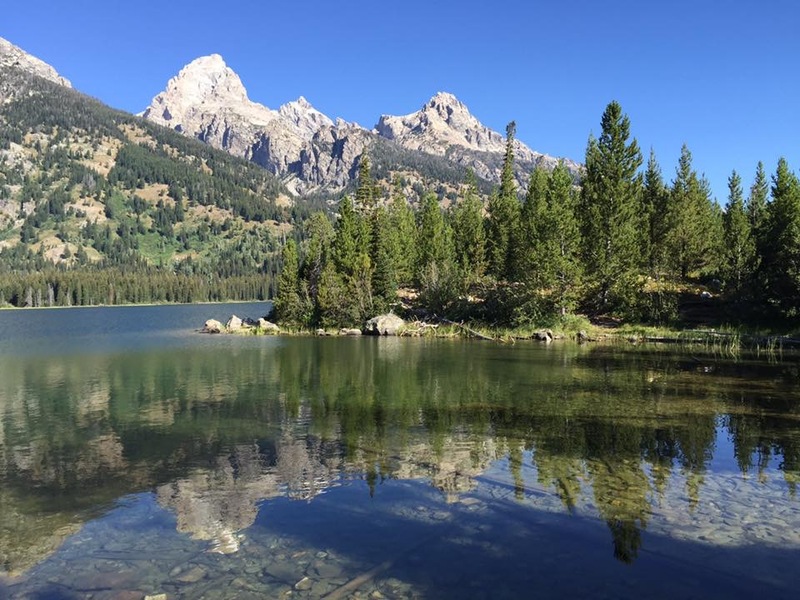 We are looking forward to having all summer to explore the area, and Dan is looking forward to fishing. In the fall, we will again work at Amazon, this time for a full season in Jeffersonville, IN. We enjoyed our time there last year, and look forward to spending more time in Louisville on our days off. We are committed to Amazon through December 23rd. After that we have not decided which direction to go. "To never take that first leap is the biggest failure many of us make"